Air / Rail / Bus Fare. Camera charges, Medical Insurance, Hard drinks, Laundry, Telephone Calls, Tips etc. GST 3.09% extra. Anything not mentioned in the inclusions. 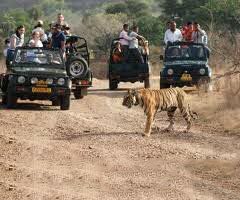 Picked Up From Airport/Railway Station And Start For Ranthambore And After Check In To Hotel Visit The Famous Lord Ganesha Temple And Amazing Fort Of Ranthambore, Later Evening Check In To Hotel Back And Sleep Early As You Have To Wake Up Early For Morning Safari Of The Mysterious World Of Tigers In Ranthambore. 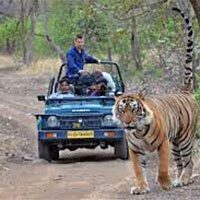 You Can Also Opt For Evening Safari But It Is Recommended To Do Morning Safari As There Are More Chances Of Spotting The Tiger. Later Evening Check In Back To Hotel For A Comfortable Night Stay. 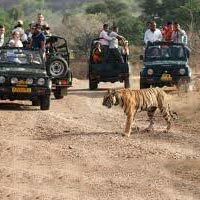 Take The Morning Safari And May Be You Could See The Tiger, Even If Tigers Are Not Seen Then Don’t Be Disappointed Because You Will For Sure See So Many Wild Animals Like Wild Boar, Deer’s, Crocodiles And Many Rarest Birds .Also Visit The Jhoomar Bawdi Which Is A Beautiful Artificial Lake. Later Evening Check In To Hotel. Early Morning After Breakfast Start For Bharatpur And After Check In To Hotel Visit The Lohagarh Fort At Bharatpur .Local Market Is A Major Attraction. Don’t Miss To Feed Your Taste Buds With Delicious Chaat.Later Evening Transfer Back To Hotel. After Breakfast Check Out From Hotel And Start For Jaipur The Pink City. 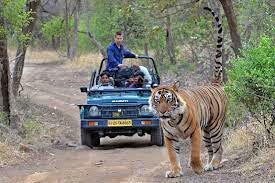 Rest Of Time As Per Your Demand .Later Transfers To Airport Or Railway Station Towards You Home With Sweet And Adventurous Lifetime Memories Of Wild Rajasthan. The Above Rates Are Valid Till 31St March 2014. If The Above Given Hotels Are Sold Out While The Time Of Booking Similar Hotels Will Be Provided. Additional Kilometers Used By The Client Which Exceeds The Blocked Kilometer Will Be Charged Extra Per Kilometer The Packages Do Not Include Entry Fees To Monuments, Guide Fees, Personal Expenses Like Telephone Calls, Laundry, Soft/Hard Drinks, Meals, Tips, And Camera Fees. Minimum 2 Pax Needed For Executing The Tour Package. Transportation Includes Of All Toll + State Tax + Parking + Driver Allowance. Rates Valid For Both Indians Nationals. Rates May Change Subject To Room / Vehicle Availability At The Time Of Booking. Kindly Release Full Booking Amount Immediately As Confirmation. Cancellation Charges Applicable As Per Actual.